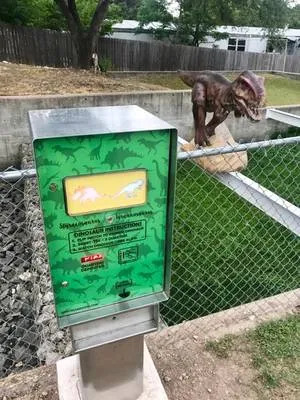 Jurassic Car Wash in Austin, TX has debuted the first coin-operated mechanical, animatronic dinosaurs in Central Texas. The two museum- and exhibition-quality dinos are a Styracosaurus and a Tyrannosaurus Rex — each 12 feet long and 6 feet tall — and can be found at the wash’s location at 4809 South Congress Avenue. The realistic dinosaurs come alive with sound for more than two full minutes with the deposit of 75 cents. When activated, the dinosaurs open and close their mouths synchronized with loud roars, trash their heads and tails from side to side, move their chests up and down to simulate breathing, and blink their red-toned eyes. The coin-activated dinosaurs operate seven days a week, 24 hours a day (the same as Jurassic Car Wash itself). There are 16 security cameras and four large LED lights on the premises to keep the facilities safe and secure after dark. The T-Rex and Styracosaurus weigh around 300 lbs. each and were manufactured to look as much like their extinct counterparts as possible — with accurate colors, proportions, and detailing. There is also a third, stationary dinosaur in the retention pond, a Velociraptor hatching from an egg. Jurassic Car Wash also features three other animatronic dinosaurs that come alive regularly and for free: a giant T-Rex that squirts water on cars as they enter the automatic wash tunnel, a Pterodactyl on the roof, and a Dilophosaurus on the building. All three come alive daily, on the hour and half hour, between 10 a.m. and 7 p.m.
“I wanted my car wash to be an entertaining one-stop shop for families,” said owner John Borek. “It’s about amusing people and making them smile.” For more information, visit jurassiccarwash.com.